Tick, tick, tick... 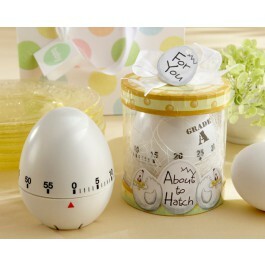 This "About to Hatch" Timer is an appropriate reminder that the countdown to Baby has begun! 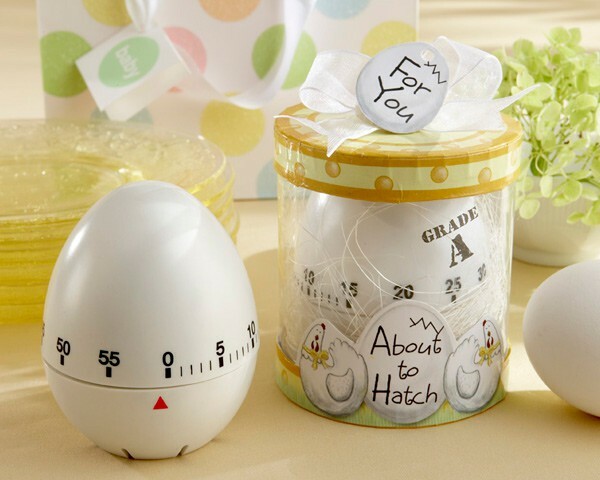 The egg-shaped timer twists at the bottom to mark any interval from 1-60 minutes. Packaged in a clear round "nest," this kitschy kitchen timer is showcased from every side. Guests can't help but love the "eggs-tra" special showcase package design, from the "Grade A" sticker to the plucky-clucky "guardian hens." The box is made complete with a sheer white organza ribbon and matching egg-shaped gift tag reading "For You!". Approximately 3" x 3"